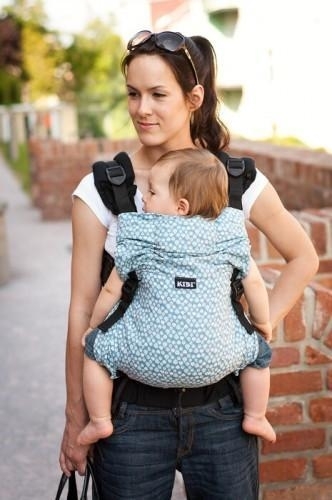 Fantastic, super adjustable carrier! Suitable from 4-6m to approx 3yrs. Back, hip and front carries possible - This is a versatile buckle carrier and allows facing in front carries with either crossed or rucksack style shoulder straps. Back and hip carries also possible (for older babies who can sit unassisted). Height adjustable back panel - From 32 to 52cm (about 12.5-20.5 inches). The back panel is loosely threaded on the shoulder straps and can be extended by simply pulling the fabric up and securing it in a higher position with 2 looped hooks. Use the extra height to offer head support for younger babies or for extra support when carrying older children. Width adjustable back panel - The lower 'seat area' of the back panel is adjustable from 31 to 52cm. For smaller babies, use the carrier on its narrowest setting by un-popping all but one set of studs at the base of the panel. Add the studs one by one as your baby grows to improve you and your baby's comfort. When used correctly, this carrier will not only support your baby's legs and hips in the ergonomic 'M' position, it will also give them 'knee to knee' fabric coverage (a thumbs up for your little one's comfort)! Highly adjustable waist belt and shoulder straps - waistband range from 62-132cm (24-52 inches). Minimum shoulder strap length 41cm (16 inches). A good option for smaller bodied wearers. The Kibi carrier has been tested for children weighing up to 20kg, and has passed European safety standards for soft baby carriers. Fabric is also certified as free from harmful substances and highly durable. Machine washable at 30 degrees. Tumble drying not recommended. The instructions for the KiBi carrier can be found here.